It’s American Artist Appreciation Month! 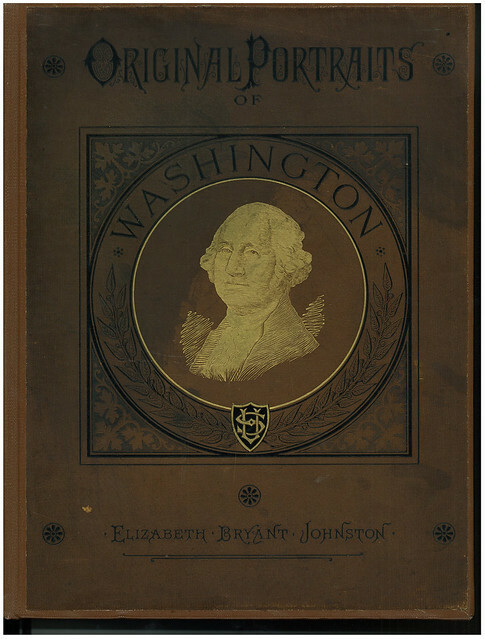 Perusing the special collections of the American Art & Portrait Gallery Library, I came across Elizabeth Bryant Johnston’s 1882 compilation, Original Portraits of Washington, Including Statues, Monuments, and Medals. I found the fact that she was a woman author, coupled with an early publication date, intriguing. As August is American Artist Appreciation Month, I found this book an interesting expression of one local woman’s interest in American art. Though having been rebound to facilitate research and ease of use, the book’s original light brown cover has been retained. A gilded print of Washington sits in its center, although the artist is not identified. The book’s title is ornately printed above George Washington, with the author’s name featured prominently underneath. Oversized, measuring 11.5” x 14”, and 257 pages in length, the book’s pages are also gilded with gold leaf. Johnston expectedly includes the renowned George Washington portraiture artists, granting Charles Willson Peale, John Trumbull, and Gilbert Stuart extensive biographies and numerous prints of their artwork. However, she also makes an effort to include a number of women artists in her compilation. Eleanor (Nelly) Parke Custis, as the granddaughter of Martha Washington and the step-granddaughter of George Washington, receives the most attention. Johnston describes Custis as “a very accomplished woman—a linguist, a musician, and possessed of rare taste in art.” Custis’ Shadow Portraits are said to accurately portray the silhouettes of both George and Martha Washington. At its simplest, Original Portraits of Washington is an art catalog. While Johnston had not been described as an art scholar or critic, she brings together artists who employ different media, of varying success, men, women, and even a few Europeans. Her art appreciation stems from her patriotism, and is united by her fascination with George Washington. Many thanks to the Columbia Historical Society reference staff for their assistance. Johnston, Elizabeth Bryant. George Washington day by day. New York: Cycle Pub Co., 1895 [c1894]. Biographical Sketches of the Painters. Philadelphia, Lindsay & Baker, 1880. Cadou, Carol Borchert. The George Washington Collection: Fine and Decorative Arts at Mount Vernon. 1st ed. Manchester: Hudson Hills Press, 2006. Eisen, Gustavus. Portraits of Washington. New York: R. Hamilton & Associates, 1932. Previous Post Happy Birthday Smithsonian Institution! I’m an American Artist and am overjoyed to have come across this wonderful site…we have a mountain I can see here in Tucson that I feel looks like President Lincoln’s profile and I’m very pleased to see the above book about President Washington. I will subscribe to your website immediately; thank you! (P.S. I don’t know whether you want to publish this or not; I’m a much better artist than speaker!) Hope to be hearing from you soon. Have a great day…. Can you tell me the history of American Artist Appreciation Month? I am unable to find any information to validate this observance, including searches in various government levels for proclamations. I would like to use this in my August newsletter and would greatly appreciate a response. I realize this post was made 5 yrs ago, and I am assuming comments are still forwarded to the author? Thank you for your comment. Yes, the post is a bit old and the author is no longer here at the Smithsonian to ask about her source. I haven’t found a history of the American Artist Appreciation Month but have found several references to it in various calendars, including the American Libraries Association Public Programs Office site here: http://www.programminglibrarian.org/node/338 . My guess is that it is not an “official” month, proclaimed by a president or passed by legislation, but more an observance accepted by various groups. If you find any additional information in your research, please let us know!